If you haven't noticed, I love doughnuts. Pretty much all doughnuts, well...most doughnuts. But, I love these doughnuts and that's what really matters right? 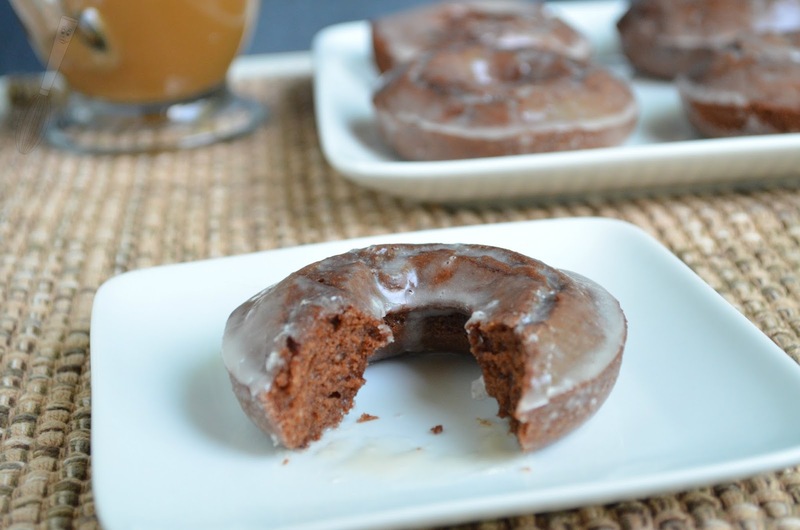 These are cake-like dark chocolate doughnuts that are baked, not fried. I've made fried doughnuts before and they're great but so bad for you even though they're so good. Just like these, except these are better for you. Not good, but better than fried :) so it's like they're good for you. I make doughnuts maybe every few weeks, all different types. On this blog alone I've posted ten different recipes, and that doesn't include the ones we ate before I remembered to take pictures (oops). Lemon doughnuts, spudnuts (potato doughnuts), pumpkin doughnuts with cinnamon glaze, grapefruit and olive oil doughnuts, cinnamon doughnuts with hot chocolate dipping sauce, margarita doughnuts, and apple cider doughnuts...are some of them, oh my! You could say I have a problem but really, these are all so good I would make them again tomorrow. I've been making more baked doughnuts though because I don't keep a pot of oil hanging around the house because then I will have fried pickles, fried mozzarella sticks, and who knows what else tempting me. Baked doughnuts are also not yeast raised and so they're quicker to make, 30 minutes tops usually before the first batch is out of the oven, from start to finish. So last weekend I was thinking about doughnuts and decided to make these. I altered the recipe so it only made five because if I'm making doughnuts I don't need a dozen and I don't know the neighbors that well. So...between my husband, my son, and I we managed to take care of just five doughnuts pretty easily :). 1. Preheat oven to 375F. In a medium bowl, stir together the flour, sugar, cocoa powder, baking soda, and vanilla. 2. Stir in the egg, yogurt, milk, and butter until blended and smooth. Stir in the chocolate chips. 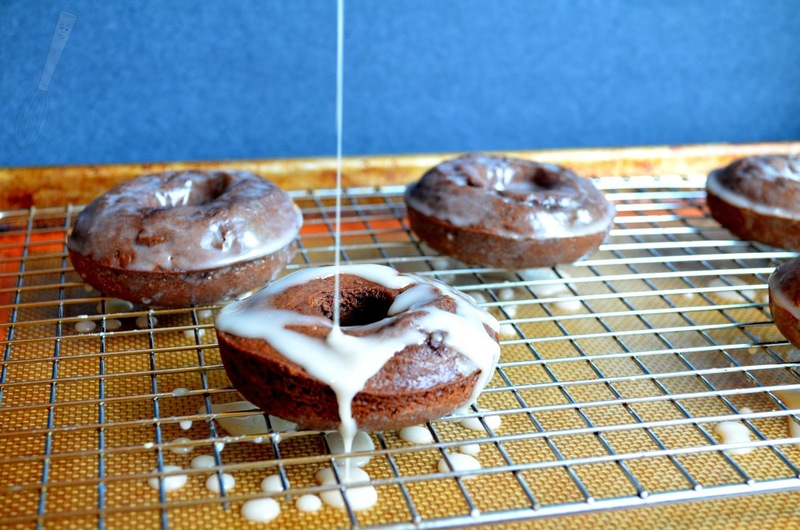 Using a piping bag or a spoon divide the batter evenly between 5 doughnut cavities of a standard sized doughnut pan that has been lightly greased. 3. Bake for 8-9 minutes or until the doughnuts spring back when touched lightly. 4. In a small bowl whisk together the powdered sugar, milk, and vanilla until smooth. 5. 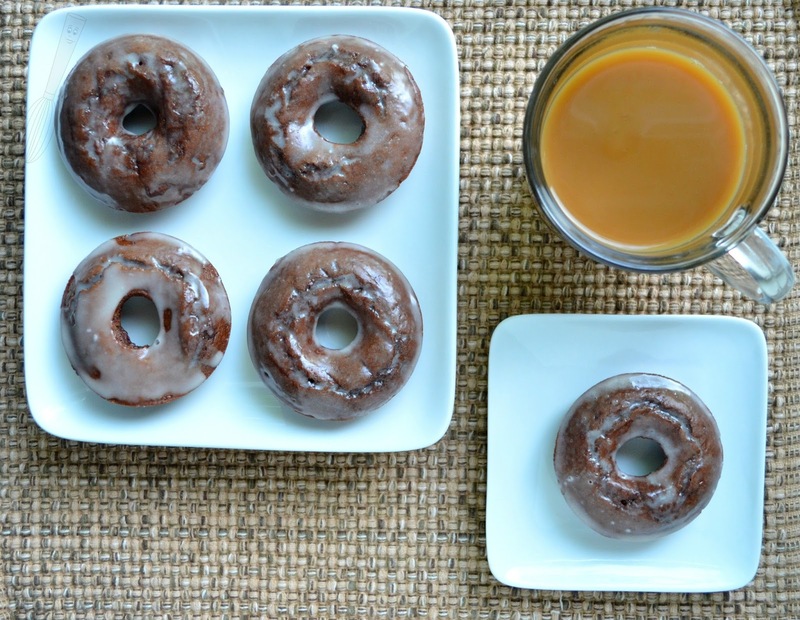 After the doughnuts have cooled 1-2 minutes, dip in the glaze then let the glaze harden slightly before serving. Serve warm, preferably these should be eaten within an hour or the glaze will soak in too much and they may become soggy. If you are not going to be eating these right after baking then wait to put the glaze on until right before serving them.